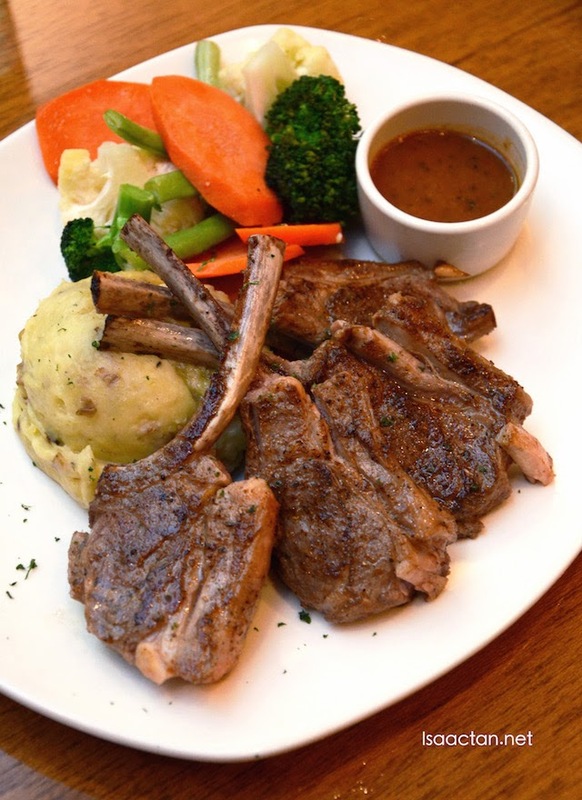 Now I've been to Outback Steakhouse's first outlet in Bukit Bintang (Outback Steakhouse Bukit Bintang) a while back, and it did left quite a lasting impression on me especially their delectable deep fried mushrooms. This time around, I was invited to try out their fares over at their 2nd outlet in Nu Sentral Mall, KL. Check out what we had that evening below. Inspired by the hit movie Crocodile Dundee, Outback Steakhouse was conceptualized as an American outlet with an Australian theme. When I was there that evening, I noticed the crowd was a mix, locals, working folks and families dining. Located at the lower ground floor of Nu Sentral mall, the 150-seater restaurant is decked in warm contemporary wood furnishing offering diners a sumptuous perspective of al Fresco dining. 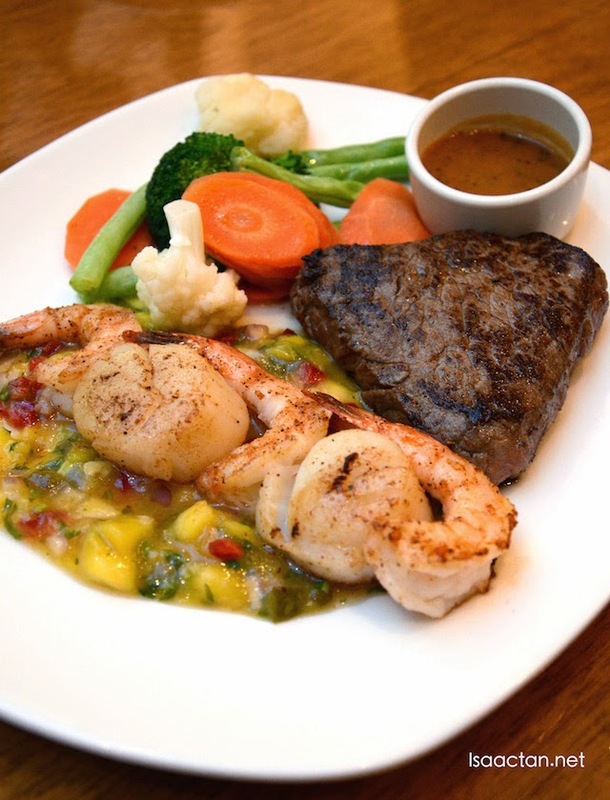 Almost similar to the Surf and Turf dishes you get elsewhere, Outback Steakhouse's Steak and Seafood mixed grill had a very generous serving of a 6oz sirloin paired with freshly seared shrimps. On top of that it has these rather large and succulent scallops on a bed of diced mango salsa. Pretty good stuff, and if you're like me, a person who loves his steak, the sirloin steak here really fills you up proper. I've had the chance to bite into the Outback Special, a very big chunk of sirloin steak (8oz of it), which is leaner than the rib eye steak, but still very yummy. It came with side dishes of some brocolli and vegetables with potatoes, but what strikes me as being outstanding is its 2 inch thick sirloin steak. Good stuff here. I've come to expect really generous and good steak, seasoned with their secret 17 blend of spices. 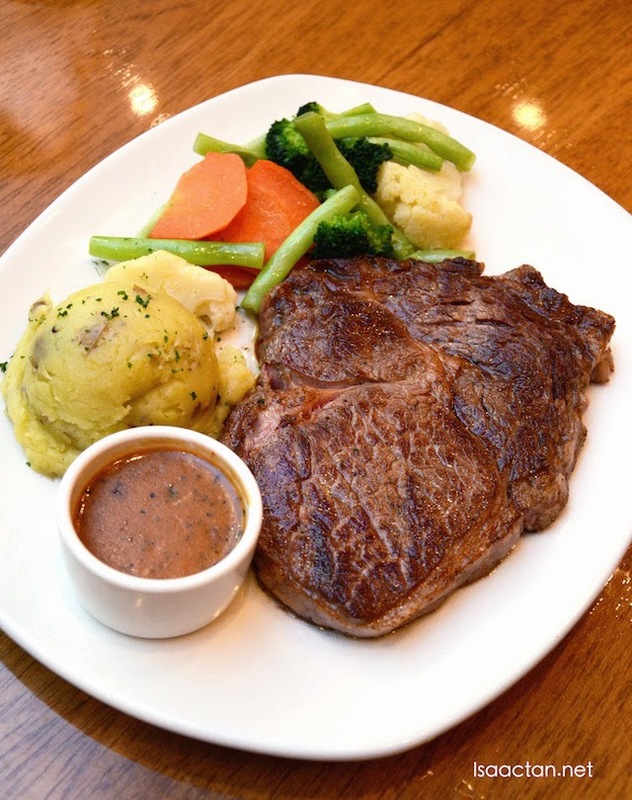 A steak lover's dream, the ribeye is seasoned and chargrilled over an open flame. Well marbled, juicy I could not get enough of this. 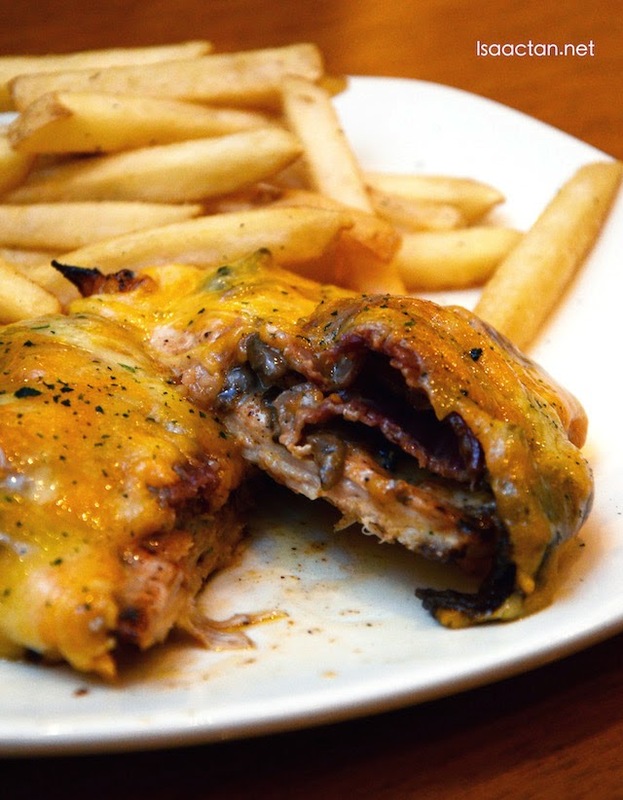 Definately a must try if you are planning to dine at Outback Steakhouse. 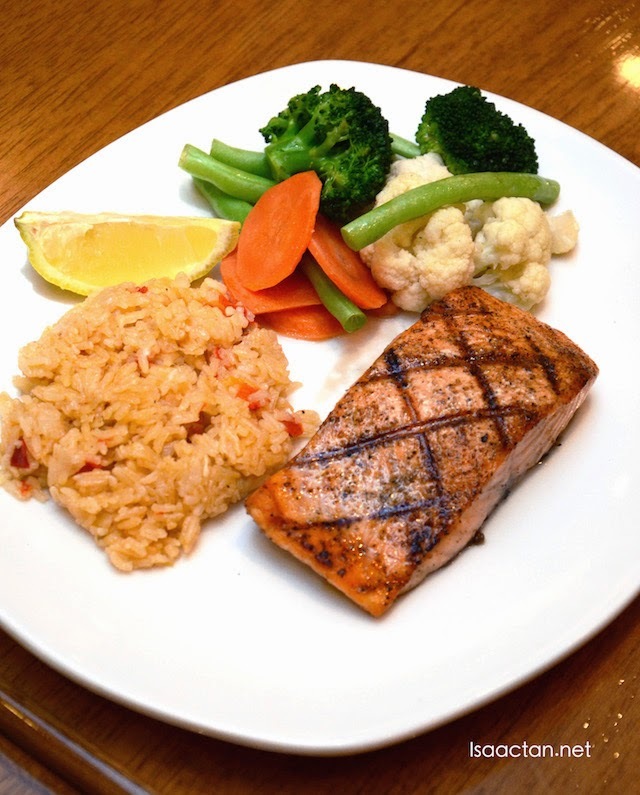 A dish suited for the salmon lovers, Outback Steakhouse serves some very nice Grilled Salmon. Fresh salmon fillet seasoned and then grilled just right, the dish is served with healthy seasonal vegetables on a bed of rice pilaf. Janice loved this dish, as it had that very nice smoky salmon texture and flavour when taken. A poultry dish, the flame grilled chicken breast dish, aptly called the Alice Springs Chicken looked sinfully delicious and tasted even better. 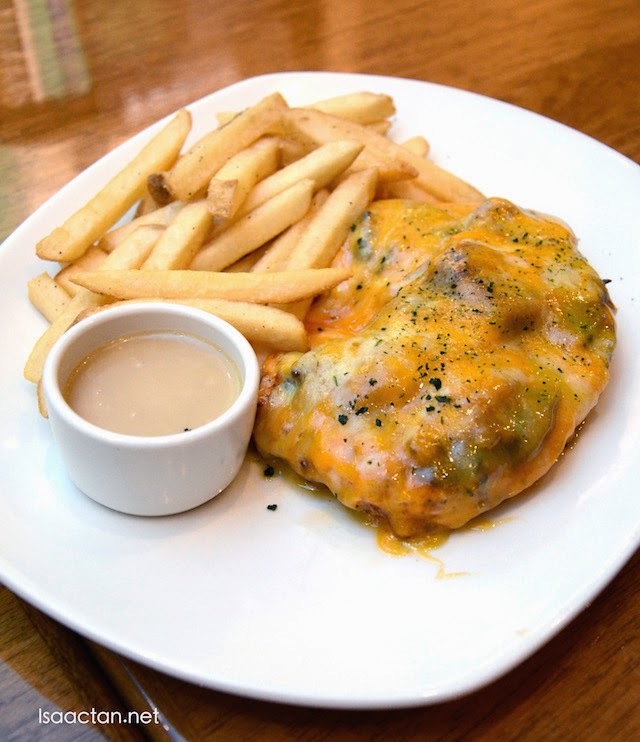 Topped with sauteed mushrooms, crispy beef bacon, melted Monterey Jack and Cheddar cheese and finished with their own honey mustard sauce, no wonder I am unable to keep my waistline slim these days. 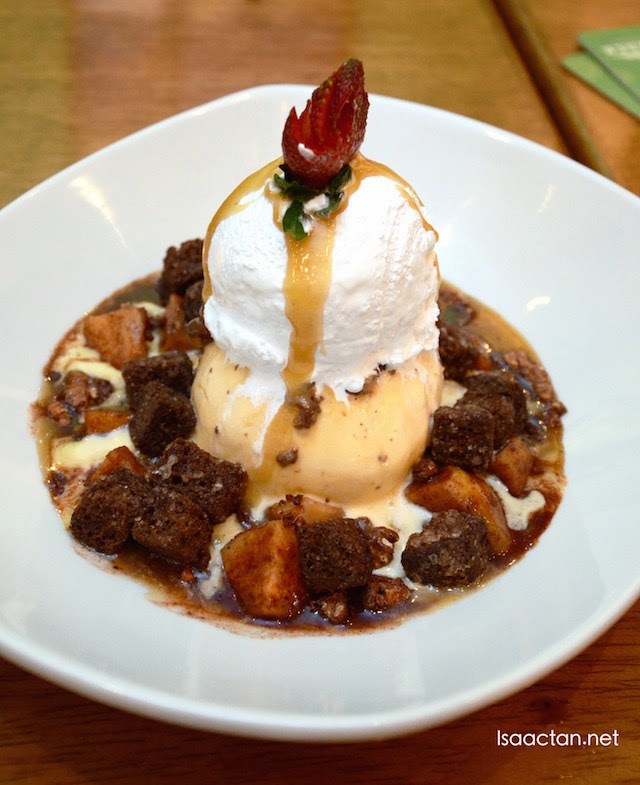 One of Outback Steakhouse's popular dessert dish would be their Cinnamon Oblivion. The sweet dessert came with creamy vanilla ice cream in home-made candied pecans. The ice cream is surrounded by warm cinnamon apples and caramel over the top. Sprinkle some fresh cinnamon-butter croutons on the dessert and we've got ourselves an irresistible dessert to end a rather hearty meal over at Outback Steakhouse Nu Sentral Mall. 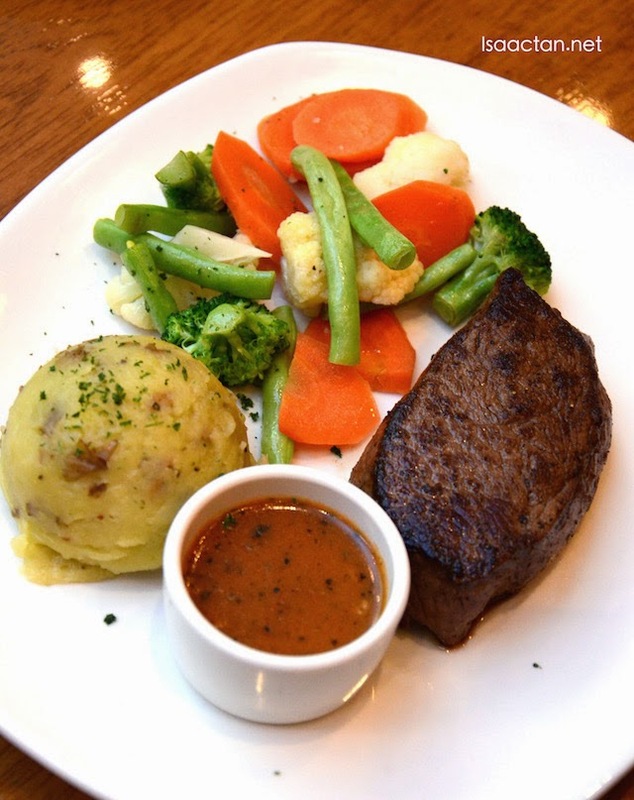 Do drop by Outback Steakhouse should you be on the lookout for some nice western fare in the vicinity of KL Sentral.